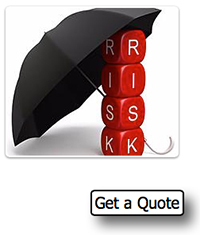 Personal Umbrella Insurance Policy--Delaney Insurance Agency, Inc. Umbrella policies tend to provide broader coverage over one or more primary policies, in that they usually lack "follow form" clauses, their definitions of what is covered may be broader than the definitions in the primary policies, and they sometimes lack exclusions used in underlying primary policies. Thus, an umbrella policy may cover certain risks from the first dollar of loss or liability incurred, which were never covered under the primary policies. For those risks that are left uncovered by primary policies but are covered under the umbrella policy, the latter is said to "drop down" to cover them as primary insurance and fill in the gaps in the underlying policies. Hence, the "umbrella" nomenclature is a reference to the broader coverage of the policy. Personal umbrella policies are typically made excess of a person's homeowner's and automobile insurance. It can also cover your watercraft and any rental properties you own. Coverage varies by the company, and detailed comparisons are can be constructed showing the differences. Customers are generally high-net-worth individuals, and in the United States, a trade group called the Council for Insuring Private Clients was formed in 2012 to focus on this market. As of 1995, the largest personal insurer in the United States, State Farm Insurance, reportedly had 1.4 million personal umbrella policyholders in the United States, and in 2008 12% of its customers had umbrella coverage. If you're sued for $1.5 million but only have $1 million in general liability insurance, an Allied Commercial Umbrella Insurance policy could pay the outstanding $500,000, leaving your business assets or profits untouched. It's our best defense against an unusually high loss when the limits of an underlying policy have been reached. Most personal umbrella losses are related to auto accidents, with a 2013 analysis finding that 78% of claims and 87% of losses related to autos. In a prior 2000-2005 survey, most of the losses were not covered by the underlying policy ("drop-down"), while in 2013 most were in excess of the underlying. Contact us today to review your coverage and help you find peace of mind through adding a personal umbrella over your autos, home(s), watercraft and rentals.